Stargazing is among the most peaceful and inspiring outdoor activities. 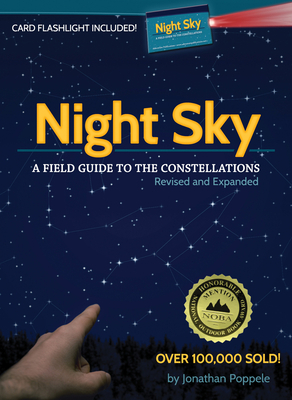 Night Sky, the award-winning book by Jonathan Poppele, makes it even better Take a simple approach to finding 64 constellations by focusing on one constellation at a time, instead of attempting to study dizzying charts. Start with the easy-to-find constellations during each season and work toward the more difficult ones. Better yet, you'll learn how to locate any constellation in relation to the Big Dipper, the North Star, and the top of the sky. With multiple ways to locate each constellation, you'll know where in the sky to look and what to look for Along the way, you'll be introduced to mythology, facts, and tidbits, as well as details about the planets, solar system, and more. This revised and expanded edition includes new photographs, new discoveries, and more constellations, including a section that introduces the 44 constellations of the Southern Hemisphere. Jonathan Poppele is a naturalist, author, and educator with wide-ranging interests. He earned a master's degree in Conservation Biology from the University of Minnesota, studying citizen science, environmental education, and how to cultivate a personal relationship with the natural world. He has taught college level environmental studies, biology, and writing courses and currently teaches in the Department of Writing Studies at the University of Minnesota. An avid outdoorsman and student of natural history, Jon is a member of the Astronomical League, the Minnesota Astronomical Society, the Minnesota Trackers Club, and the International Society for Professional Trackers. A Black Belt in the peaceful martial art of Ki-Aikido, Jon is the Founder and Director of the Center for Mind-Body Oneness in Saint Paul, Minnesota. You can reach Jon through his website at www.jonathanpoppele.com, follow him on Twitter @jonathanpoppele, or join him on Facebook.